No matter what vehicle you drive -- Flowmaster has a system specifically for it with the tone you desire. The Force II system is designed to provide plenty of "Flowmaster tone" under acceleration but produces lower sound levels while cruising. Flowmaster's systems will improve acceleration and passing power, as well as help improve fuel mileage. Every system is individually engineered and dyno-tested for each application and includes all required mounting hardware. All tubing is mandrel bent for superior exhaust gas flow, and is a key to the system's performance improvements. 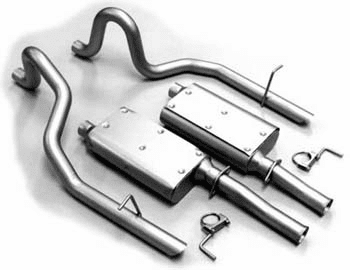 Both mufflers and tubing are fabricated from aluminized steel for corrosion resistance. Complete Flowmaster systems outperform most OEM and competitive aftermarket exhaust systems. Why? Because all Flowmaster systems are designed and tested for each specific type of vehicle. Our systems always include design specific muffler applications and mandrel bent tubing which work together, creating a general improvement in power, exhaust tone and gas mileage. Should I use an "H" or Balance pipe? An "H" pipe, commonly referred to as an equalizer, balance or crossover pipe, connects the two exhaust pipes. It will balance the pressure of the exhaust pulses in the system, thereby reducing interior and exterior sound while increasing power. In general the "H" pipe should be installed as close as possible to the header collector. With manifolds, the "H" pipe should be laced just past where the downpipes become horizontal. "H" pipes should be the same diameter as the main pipes or no-more than 1/2" smaller. Tailpipes aid in keeping atmospheric pressure from rushing back into the muffler. Tailpipes can improve performance and control sound. In addition, tailpipe length can affect the power as well as sound. Tailpipes should be a minimum or 10", and not longer than 6' Tailpipe length of more than 6' may need a resonator. The size of pipe used in an exhaust system is a critical item to consider. Pipe diameter will affect the sound level and performance characteristics of the muffler, but keep in mind that bigger is not always better. Too large of a pipe can actually hinder exhaust scavenging by allowing atmospheric pressure up the pipe. As a rule, most general street applications use 2.00" through 2.50" pipe, while modified street applications will generally use 2.50" or 3.00" pipe. © 2019 Auto Barn. All rights reserved.